Rare snowfall in November has caused serious damage to apple orchards and inflicted losses on fruit growers in Kashmir. 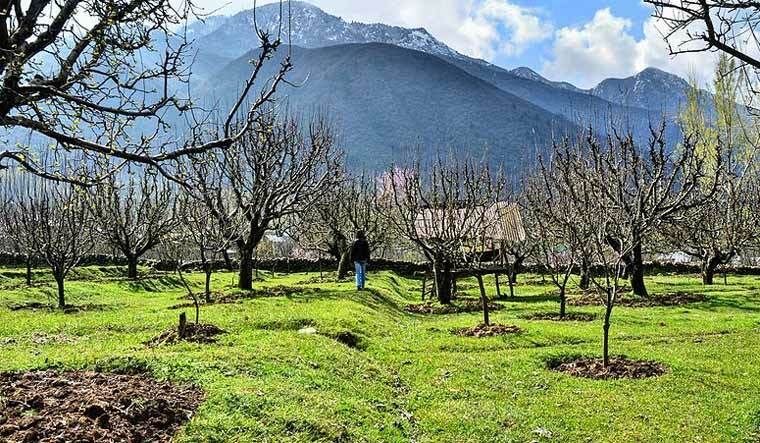 Apple growers in many parts of Kashmir said the snowfall has damaged the orchards. The anxiety of many fruit growers was compounded because of the more-than-5,000 truckloads of apples being stranded on Srinagar-Jammu national highway owing to snow. They fear that the fruits would decay if it doesn't reach the destination on time. A spokesperson of Kashmir Fruit Growers And Dealers Association at Sopore said, "Thousands of apple-laden trucks have left for Delhi ahead of Diwali on November 7. The trucks have got stuck on the Srinagar-Jammu highway and there are no efforts from the state government to facilitate their early clearance. Delhi is our main focus ahead of the festival and we were hoping the fruit would reach there by November 4." The president of Fruit Growers Association, Fayaz Ahmed Malik, told a local daily that due to bad weather the trucks are stranded on the Srinagar-Jammu highway and they have lost a huge market. Snow has also affected the yet-to-be-harvested apples in orchards in south and north Kashmir. It has also damaged the trees in many places. The snowfall has mostly caused damage to 30 per cent unharvested fruit. Snow causes rotting of the apple due to extreme cold. Reports of loss and damage have also been reported from south Kashmir's Shopian, Kulgam, Anantnag and Pulwama districts where certain varieties are yet to be harvested. Orchards in villages of Rahmoo, Shadimarg, Rajpora, Qamrazipora and Sangarwani of Pulwama district have suffered great damage. Crop damage was also reported in Tral, Awantipora, and Khrew which are known for apple production. Authorities have said that they are giving priority to trucks carrying fruit to move to Jammu. The traffic police are regularly issuing updates about the situation on the highway. After the snowfall, the traffic between Jammu and Srinagar is being regulated and the movement of vehicles from the two places is being allowed alternately if the weather permits. PDP president and former chief minister Mehbooba Mufti, in a statement, said she was dismayed over how government authorities handled the situation after the snowfall. “No advance preparation for meeting winter challenges in the State, particularly Kashmir Valley, seem to have been made by the administration this year," the statement said. She also appealed to the Central government to consider a package for fruit growers who have suffered losses. “The state government must depute revenue teams to the affected districts and assess the losses so that they are compensated forthwith,” Mufti said in a statement.